This panel is unusually tall. The two small kneeling figures in the bottom corners may represent donors. They hold scrolls which were probably originally inscribed with prayers. 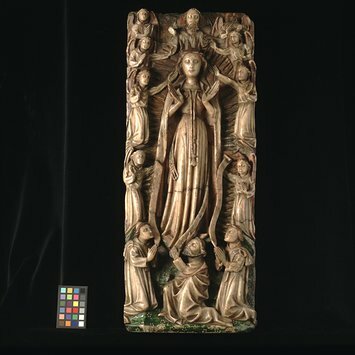 This very tall panel shows the Virgin wearing a fillet on her head, a tight-fitting gown and a cloak fastened in front by a tasselled cord, the ends held together by a toggle and looped over. 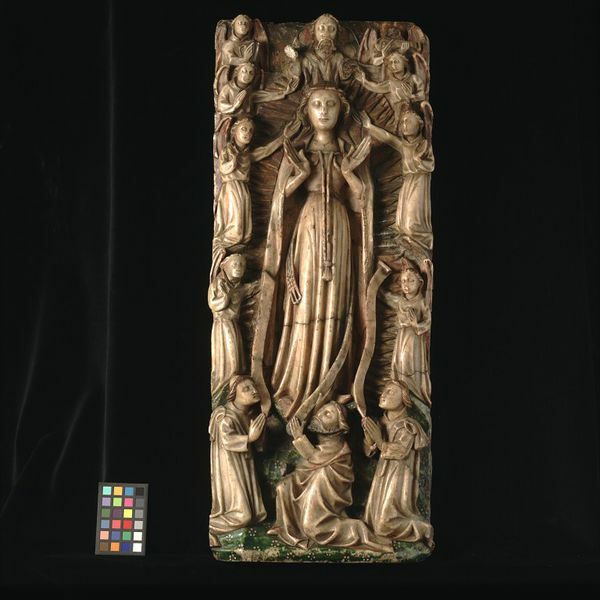 She stands in a mandorla carved with rays which is above the ground in the centre of the panel. She is flanked by three pairs of angels gesturing towards her, each with an arm outstretched. The bearded figure of St. Thomas, facing left, kneels at her feet between two kneeling tonsured figures with hoods on their shoulders. Vertical scrolls rise from their hands, which are held together in prayer. St. Thomas looks up, holding in his left hand the clasp of the Virgin's belt, which is unusually long. The belt is shown unfastened, at the moment of falling from her waist, the buckle visible on the left. The haloed and bearded figure of God the Father is at the top of the panel above a division indicating heaven. He is flanked by an angel on the left playing a small harp and an angel on the right paying a lute with a plectrum. The hands of God the Father and the head of the angel to the right are missing. There is an area of damage across the panel where a crack shows across the lower part of the Virgin's gown. The upper part of the lowest angel on the left is a restoration as are the carved rays on the same level on the right of the panel. The end of the Virgin's belt is missing. Green paint and the usual daisy pattern remain on the ground. Gilding on a brownish primer remains on the mandorla. There is some red paint on the angels' wings and on the inside of the Virgin's cloak. The halo behind God the Father is red and dark blue with lines picked out in white. The upper background is gilt, decorated with gesso knobs. The panel has been completely backed by a heavy piece of limestone. In the collection of the Duke of Leeds at Hornby Castle. Later in the possession of G. Thomas. Acquired by P. Nelson from whom it was acquired by Dr W.L. Hildburgh. On loan from him since 1926. Given by Dr Hildburgh in 1946. Alabaster panel depicting the Assumption of the Virgin. English, second half of 15th century. Nelson, Archaeolog. Journ. LXXVII, 1929, p. 213, illus. pl. X.